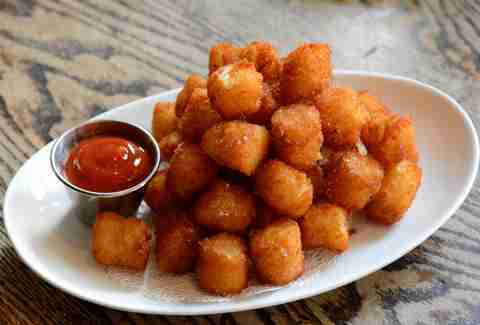 If fries, latkes, mashed potatoes, and tater tots formed a band, tots would be the Freddie Mercury. They’re the best iteration of spuds out there. That’s why we created a six-stop tot trot. Don’t worry, it’s downhill, and limited to two miles. In other words, this is the best way to trick your Fitbit into thinking you had a banner day of good health. Rule number one of living near Maryland: Old Bay makes anything better -- from crabs, to beer, to break-ups. 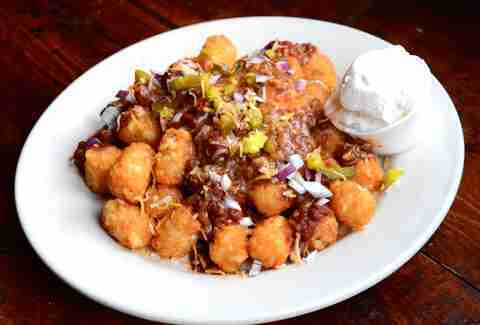 Try the spice on tots at Bourbon ($5); they’ll awaken the palate for the next five stops. The generous pile is meal-worthy on its own, but consider pairing the humungous "side" with crab cake sliders, also with Old Bay. Just remember, you have a lot of work ahead. Hasta luego, flimsy tortilla chips & strips -- tots are the "it" carb for nachos these days. 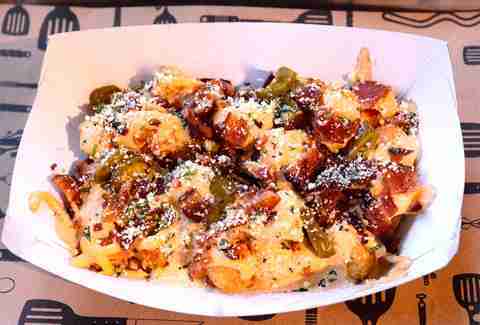 "Totchos" are growing in popularity our region. You can also find them at Tonic at Quigley’s, Thomas Foolery, and Spacebar, among others. Back to The Blaguard, where three flavors are on offer: Buffalo blue cheese, bacon cheddar, and salsa queso. The snack ($6) found under "House Favorites" requires so many napkins that it makes tree-huggers quiver. 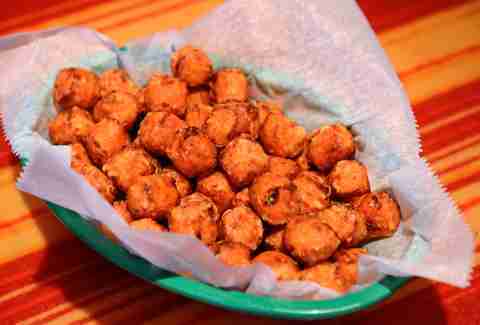 Every member of the staff at Stetsons has an opinion on what kind of sauce to pair with the bite-size sweet potato tater tots ($5.95). Hot sauce says the general manager! Guacamole says a bartender! Okay okay, the guacamole idea came from a half-baked vegetarian patron, and god bless that individual. The inside of these bad boys are nice and chunky, reminding you that yes, a vegetable was involved in the making of this fried treat that tastes like funnel cake. Mmmmm, Vitamin A. How would you like to be the guy that hand-punches tots on tots on tots every morning? ChurchKey, the bastion of good bar food, goes through 120lbs of Idaho potatoes a day, just so you can have something to pair with craft beer. 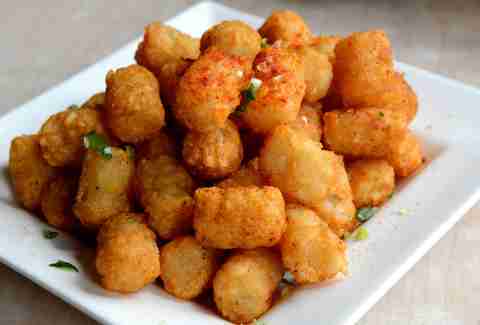 These tots ($6) take the award for most audible crunch, and the inside is the perfect blend of smooth and coarse. If there was a time to call your friend that overuses the hashtag #foodie to join you for tots, this is the stop. That’s because Lincoln’s tots ($8), made with artichoke and spinach, are dressed up even further with savory lemon curd, Parmesan cheese, and roasted olive aioli. 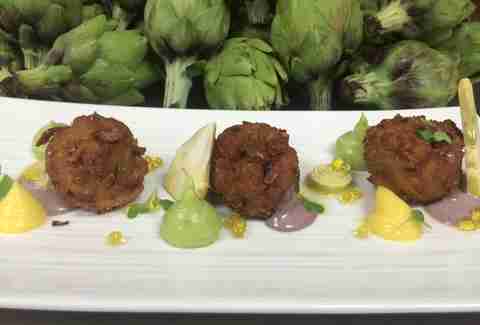 The tots, which are more like a hush puppy hybrid, change seasonally and are only $5 at happy hour. If this bowl of love reminds you a little of Rochester’s famous Garbage Plate or something from the Grease Trucks near Rutgers University, you’re on the right track. Melt Shop’s tots come smothered in cheese sauce, melt sauce (we’ll get back to this), chopped Applewood-smoked bacon, sliced jalapeños, and parsley Parmesan shake. The double trouble sauces are what gets your arteries pulsing, especially because "melt sauce" is a thick custard of mayonnaise, chipotle, pickles, and seasoning. 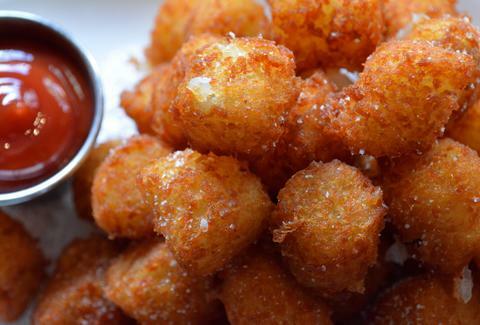 There couldn’t be a better tot order to end on.